Uncategorized | Blackhill Bounders Running Club. In Full: Built up as a flat fast course I thought I would give this a blast, and with my brother living just ten minutes away from the start line then this was a no brainer. Having arrived in Leeds on the Saturday afternoon, I and two excited kids set off for Thought Bubble at the royal armouries. Which to the uneducated is a Comic Book and Sci-FI convention, and for those that know of my geekish love all thing comics and super heroes, (Remember Bounder Man), I knew this was going to be a good weekend. 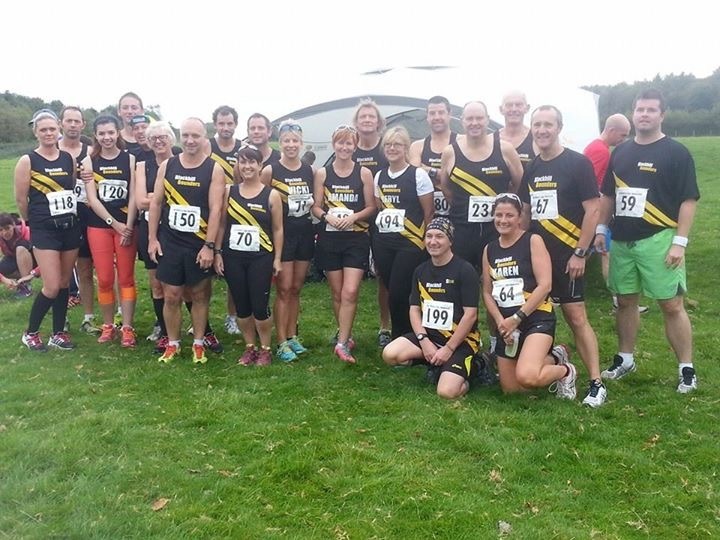 Sunday Morning I woke to the slate Grey skies that only Yorkshire could provide, and with a light drizzle and no wind the day was set for a crack at the PB, which was set just the week previous at the town moor memorial 10k in Newcastle. My training over the past year has been interrupted by both running and non-running related issues but heading to the start line I was confident. And this was helped by seeing some familiar faces from both Crook A C and also Sedgefield Harriers, who had travelled down in numbers. And soon we were off heading up a slight incline for the first 5k. This is a mass participation event and numbers are in the 1000s, so building any momentum was difficult. This was also a race in which I was not using my Garmin to monitor my pace. It was all about feel and effort. So it was with great surprise and a tad frustration I made it to the half-way point feeling fresh and as if I could have ran it faster. But soon after and the opening up of the roads as well as the slight decline in the road my pace picked up nicely. And apart from a tiny hump in the road I maintained this strong pace to the finish looking down at a 42m 09s on the stop watch, which was further reduced to 42m 07s. I have no doubt in my mind that by this race next year I will be running under 40m for 10k and will target this race to do it in. Yes it’s a long way to go for a 10k, but with a city centre finish, a German Market, and plenty of pubs nearby, maybe one or two more will make the journey next year! HEP & DAWSON, the race is on! As I was choosing my clothes for the cross country this morning, I heard a gale of wind wail across the rooftops of my bedroom; I immediately thought to myself that I needed to be equipped with more than just my vest, and pulled on my warm and snuggly, precious Blackhill Bounders hoodie. On the journey to Temple Park, I spotted a rather large dull, black raincloud hovering above the fields and the centre. We gathered our coats and entered the building, sat around for fifteen minutes, as typically, mum had been rushing to get to the location, still with bags of unnecessary time. By noon, Lorna and I were both ready for our races, with Lorna’s race starting at 12:15 and my race beginning at 12:45. I watched Lorna set off for the u11’s 0.6 mile race. Although the majority of the pack, as usual set off like it was a 100m sprint, my sister was very tactical and started off near the back of the pack. Through the race, she managed to pick many people off. Young Carvell finished with a very pleasing time of 4:16. Nervously, I warmed up for my race and again spotted my rivals and thought today is the day that I beat them once again. I had a bad start, starting at the back of the pack, but after I was up the first hill, I found myself in a comfortable position and I had already overtaken one of my rivals. The course was relatively flat, besides the three hills (but didn’t affect the Bounders of course!) and by half way I passed another one of my classmates from school. I seemed to stick with one particular Tynedale runner all the way through. As we approached the finish line, I reminded myself that I wasn’t running for the competition or enjoyment, but for my mum’s homemade bakewell cake (which Stewy Bell particularly enjoyed!) We must’ve overtaken each other at least four times, before I overtook him with about 400m before the finish line. To conclude, I was pleased with my time of 12:30 and yet again I saw the determined finish of Owen Young! It was a race well ran for both of us. It was a successful day for the Junior Bounders and I (and everyone else) is looking forward to the next fixture and to more cake!